the sensation caused by the contact of soluble substances with the tongue; the cranial nerves conducting impulses relating to taste are the facial nerve for the anterior part of the tongue and the glossopharyngeal nerve for the posterior part. Other senses, such as smell and touch, also play important roles in the experience commonly thought of as tasting. The organs of taste are the taste buds, bundles of slender cells with hairlike branches that are packed together in groups that form the projections called papillae at various places on the tongue. When a substance is introduced into the mouth, its molecules enter the pores of the papillae and stimulate the taste buds directly. In order to do this, the substance has to be dissolved in liquid. If it is not liquid when it enters the mouth, then it melts or is chewed and becomes mixed with saliva. There are four basic tastes: sweet, salt, sour, and bitter. Sometimes alkaline and metallic are also included as basic tastes. All other tastes are combinations of these. The taste buds are specialized, and each responds only to the kind of basic taste that is its specialty. The sweet and salt taste buds are most numerous on the tip and front part of the tongue, sour taste buds are mainly along the edges, and bitterness is tasted at the back of the tongue. Bitter-sweet substances are tasted in two stages, first sweet, then bitter. The solid center of the tongue's surface has very few taste buds. 1. To perceive through the gustatory system. 2. The sensation produced by a suitable stimulus applied to the taste buds. 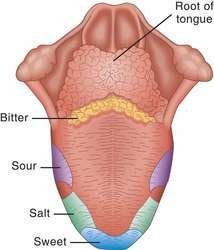 1. the sense effected by the gustatory receptors in the tongue. Four qualities are distinguished: sweet, sour, salty, and bitter. 2. the act of perceiving by this sense. 1. The sense that distinguishes the sweet, sour, salty, and bitter qualities of dissolved substances in contact with the taste buds on the tongue. 2. This sense in combination with the senses of smell and touch, which together receive a sensation of a substance in the mouth. 3. The sensation of sweet, sour, salty, or bitter qualities produced by or as if by a substance placed in the mouth. 2. To have a distinct flavor. the sense of perceiving different flavors in soluble substances that contact the tongue and trigger nerve impulses to special taste centers in the cortex and thalamus of the brain. The four basic traditional tastes are sweet, salty, sour, and bitter. The front of the tongue is most sensitive to salty and sweet substances; the sides of the tongue are most sensitive to sour substances; and the back of the tongue is most sensitive to bitter substances. The middle of the tongue produces virtually no taste sensation. Chemoreceptor cells in the taste buds of the tongue detect different substances. Adults have about 9000 taste buds, most of them situated on the upper surface of the tongue. The sense of taste is intricately linked with the sense of smell, and taste discrimination is very complex. Many experts believe the capacity to perceive different tastes involves a synthesis of chemoreactive nerve impulses and coordinating brain processes that are still not completely understood. 1. To perceive through the medium of the gustatory nerves. 2. The sensation produced by a suitable stimulus applied to the gustatory nerve endings in the tongue. One of the five special senses. Taste is mediated by specialized nerve endings on the tongue called taste buds. These can distinguish only sweet, salt, sour and bitter, but, in combination with the wide range of perceptible smells, allows an almost infinite number of flavours to be experienced. 1. To perceive through gustatory system. 2. Sensation produced by a suitable stimulus applied to taste buds. n the sense of perceiving different flavors in soluble substances that contact the tongue and trigger nerve impulses to special taste centers in the cortex and the thalamus of the brain. The four basic traditional tastes are sweet, salty, sour, and bitter. n any one of many peripheral taste organs distributed over the tongue and the roof of the oral cavity. See also lingual papillae. n.pl food additives that have little or no flavor of their own but when added to food bring out the taste of certain foods. Monosodium glutamate (MSG) is the most common flavor or taste enhancer. the peculiar sensation caused by the contact of soluble substances with the tongue; the sense effected by the tongue, the gustatory and other nerves, and the gustatory center. There are four basic tastes: sweet, salt, sour and bitter. Sometimes alkaline and metallic are also included as basic tastes. All other tastes are combinations of these. The taste buds are specialized, and each responds only to the kind of basic taste that is its specialty. The location of and the number of taste buds varies between animal species. Other senses, including smell and touch, also play an important role in tasting. the organ of taste; spherical nests of cells embedded in the mucosa of the mouth and tongue are composed of supporting and gustatory cells. 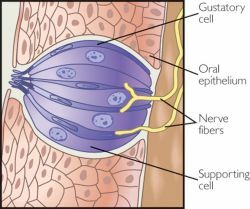 The gustatory cells have a delicate, hairlike process which protrudes from the peripheral surface of the cell. Substances must be in solution to be tasted, solids must be chewed and mixed with saliva. animals have been shown to develop aversions to foods associated with illness or other adverse experiences. theoretically, the reverse of conditioned taste aversion, which is a naturally occurring phenomenon; it is not widely accepted that animals will associate recovery from illness with a specific taste or food. opening from the exterior to a taste bud. one of the three types of cell in a taste bud; called also gustatory cells. For example, sweet tastes are associated with energy-rich foods needed for survival whereas bitter flavors are more commonly associated with natural toxins to be avoided. Mice in which CALHM1 proteins are absent, developed by Feinstein's Philippe Marambaud, PhD, have severely impaired perceptions of sweet, bitter and umami compounds; whereas, their recognition of sour and salty tastes remains mostly normal. The research, published in the Archives of Disease in Childhood, found the obese children were significantly less likely to identify the individual taste sensations correctly, particularly salty, umami, and bitter tastes. During pregnancy the sense of smell is also affected, and because the sense of smell is related to taste, this can account for metallic tastes in the mouth. These weren't ordinary mice, however--some of the test mice did not have the special proteins associated with already known tastes. 3 : to recognize by the sense of taste <I can taste salt in the soup. Food is tasted by our 10,000 taste buds which are located on and around the little bumps on the tongue. Taste: The lasagna had a watered-down, creamy texture with a strong spinach taste. Two teams of scientists have identified a protein on the surfaces of select tongue cells that may be the long-sought detector of sour taste. Previous research into taste has revealed that the human tongue has about 10,000 taste buds with five taste sensations: sweet, bitter, salty, sour and umami. As Cutler suggests, reposados represent a perfect blend of ripe agave and age, but American tastes may perceive it as more of a blended scotch to the single-malt style of anejo, rendering it somewhat less attractive. The company has figured out how to turn fat-free milk into something that tastes exactly like rich, full-fat sour cream.